January 17th, 2019 – Lamacchia Realty is proud to announce Sacha Anastasio as the winner of the Most Sales Norwood award for 2018 with 23 sales! “Sacha has been a wonderful part of our company since the day she joined. Not only she is a tremendous Realtor, but she is a leader by example in the company. She should be very proud of all she has done in the business,” said Anthony Lamacchia, Broker/Owner. Sacha has been a top Realtor with Lamacchia in the company’s Norwood office since August 2015. She won the 2018 Leading RE Relocation Contest because she referred more clients to buy or sell around the country within our Leading Real Estate Companies of the World network than any other Realtor in the company. 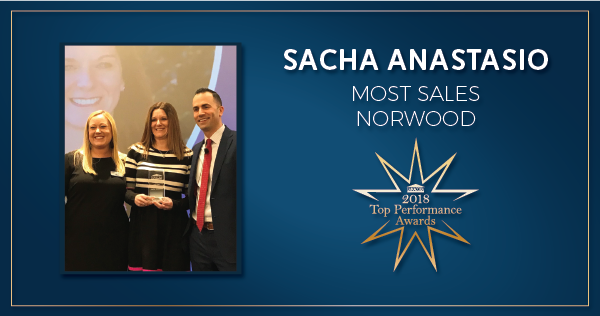 Sacha was also recognized as a Top 3 Producing Realtor for the Norwood office for all of 2018. Lamacchia Realty Norwood was number one in Sales Volume of any Independent brokerage in 2018. To learn more about Sacha click here! Lamacchia Realty is steadfast in enriching agent success with weekly company-wide training and coaching sessions as well as by recognizing outstanding agent performance. Although they are based in Massachusetts, they are a proud member of Leading Real Estate Companies of the World® which means they can further help refer and close transactions throughout the country and the world.